Did you know that, on average, a human being spends more than 30% of his lifetime sleeping? This should not come as a surprise as our bodies need to recover and reboot after a busy and hectic day. When you are asleep, all the tissues and muscles that need repairs are taken care of, so that when you wake up, you feel all refreshed and ready to take on the challenges a new day has. Do not consume foods and drinks that contain ingredients that can make sleeping difficult. If you like to drink coffee too late in the day, you are not helping your body get its much needed sleep. The caffeine in coffee actually causes an energy boost that can last for several hours. If you want to go to sleep, you do not want to your body telling you to find something to do, or your brain running thoughts and ideas a hundred miles per hour. It is best to leave your coffee fix in the mornings or early afternoons to allow the effects of caffeine to wear out well before you go to sleep. To help regulate your body’s internal clock, you should stick to a sleep schedule. If you can, you should have the same wake up and sleep times, whether weekdays or weekends. Try to avoid sleeping really late at night and getting out of bed early in the morning on weekdays, and then going to bed in the morning and waking up late in the afternoon on your days off. This will mess up your body clock and lead to difficulty in falling asleep. Napping during the day gives you a small, quick boost that you need to last until it is time to clock out. However, it should be done early in the day, probably right around lunchtime, and should be short, maybe between 10 to 30 minutes, to not affect your bedtime. If your naps take longer, you are risking subjecting yourself into the deeper stages of sleep, resulting to you feeling so groggy once you wake up. Transform your bedroom into a quiet, sleep-inducing environment. To enjoy a good sleep, your room should be devoid of noise, bright lights, and other disturbances. You should decorate your room with furniture and other items that can help you get a comfortable and uninterrupted slumber. Put up blackout curtains to prevent lights from cars and lampposts outside from shining through your window. Set your air conditioning to a cool temperature that suits your preference. Play some soft and soothing music to improve your sleep quality. Make sure that your mattress and pillows are comfortable. It is important that you sleep on bedding that offers excellent comfort and support for a good night’s sleep. Your mattress should just be the right kind of soft to hold up your back and the rest of your body without leaving you in pain or feeling sore the next day. You should also have enough pillows for your head, neck, lower back, or legs. Drink a cup of chamomile tea before bedtime. Many people have a hard time falling asleep because they feel so stressed and anxious. They may be burdened with too much pressure at work, or dealing with exams and deadlines in school. Combating all these negativity as soon as possible is very important, so that good quality sleep can be had. Before bedtime, enjoy a warm mug of chamomile tea. This herbal drink is rich in antioxidants that aids in better sleep and digestion. It also calms the nerves and relaxes the senses, and lowers the risk of various diseases, such as cancer and heart diseases. Shower or bathe before going to sleep. A quick hot bath or shower right before bedtime should help induce sleepiness. It helps your mind and body relax, and also gets rid of oil, dirt, grease, and other impurities your body has accumulated during the day. Do not use your laptop or phone in bed, right before going to sleep. Before you sleep, you should only engage in activities that contribute to relaxing your mind and body. Do not take your laptop with you to bed to do some more paperwork your boss asked you to complete by the end of the week. Do not pile all your credit card, utility, and other bills on the bed, sorting them, and going through each of them. Do not check your Instagram or Facebook likes on your phone as you are about to go to sleep. It is crucial that you relax and clear your mind once you are in bed to prepare for a long and relaxing slumber. If you still cannot sleep after half an hour in bed, move to another room and find a relaxing activity to do until you feel sleepy. Sometimes, sleep just takes a long time to kick in. 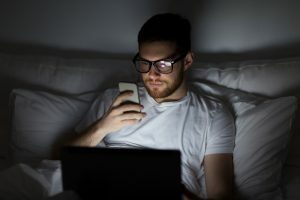 If you have been in bed for almost an hour, and your eyes are still not feeling sleepy and heavy, move to your study, living room, or guest room, and read a book, listen to music, meditate, or paint. Do any of these until you feel tired or ready to go back to bed. Exercising has a long list of benefits. They are great for losing weight, toning muscles, preventing heart diseases and other medical disorders, and improving strength, stamina, and endurance. They are also useful in reducing anxiety levels and enhancing sleep quality. If you want to get 7 to 8 hours of sleep every night, you should get into a regular exercise routine.